Alterations in arginine vasopressin regulation and secretion have been proposed as one possible biochemical abnormality in patients with obsessive-compulsive disorder. In golden hamsters, arginine vasopressin microinjections into the anterior hypothalamus trigger robust grooming and flank marking, a stereotyped scent marking behaviors. The intensity and repetition of the behaviors induced by arginine vasopressin is somewhat reminiscent of Obsessive Compulsive Disorder in humans. The present experiments were carried out to test whether pharmacological agents used to alleviate obsessive compulsive disorder could inhibit arginine vasopressin-induced flank marking and grooming. Male golden hamsters were treated daily for two weeks with either vehicle, fluoxetine, clomipramine, or desipramine (an ineffective drug), before being tested for arginine vasopressin-induced flank marking and grooming. Flank marking was significantly inhibited in animals treated with fluoxetine or clomipramine but unaffected by treatment with desipramine. Grooming behavior was not affected by any treatment. These data suggest that arginine vasopressin-induced flank marking may serve as an animal model for screening drugs used in the control of Obsessive Compulsive Disorder. In golden hamsters, microinjections of arginine vasopressin (AVP) into the anterior hypothalamus trigger grooming and flank marking, a stereotyped scent marking behavior [1, 2]. Within a minute after AVP microinjections, hamsters start to lick and comb sebaceous glands situated on their dorsolateral flanks. Bouts of flank gland grooming may be so intense that the flanks are left matted and soaked in saliva. Flank marking behavior is observed soon after the onset of grooming, and usually within two minutes of the microinjection. Flank marking is a scent marking behavior involved in olfactory communication , and is characterized by arching the back and rubbing the flank glands vigorously against objects in the environment. The concentrations of AVP required to induce flank marking are low (ranging from 0.1 to 100 μM) [4, 5] and the volumes microinjected in the anterior hypothalamus are small (ranging from 20 to 100 nl). 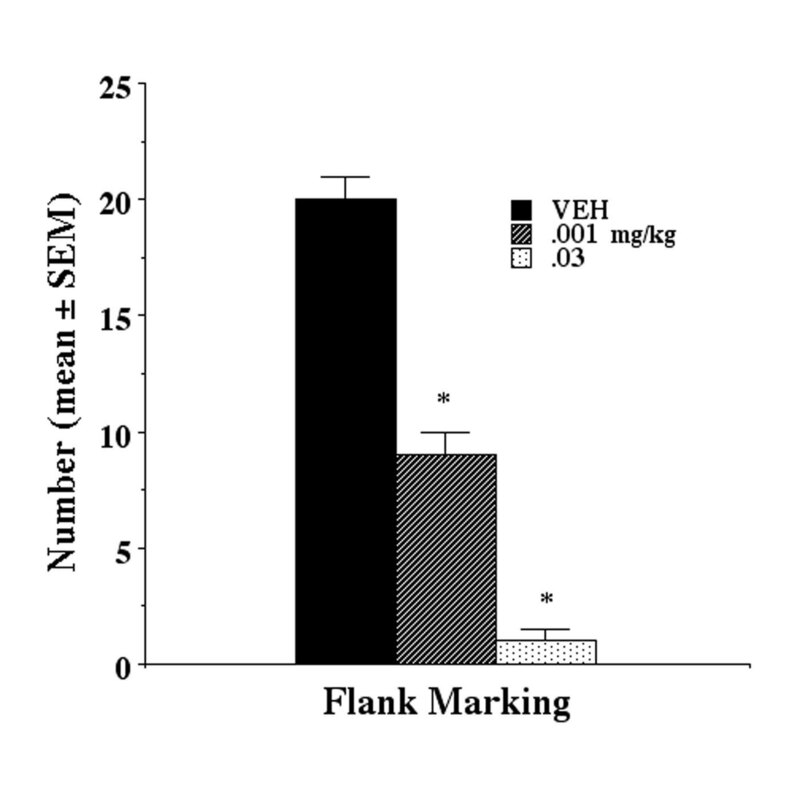 The activation of flank marking is dose-dependent, and specific to AVP, as microinjections of other neuropeptides, excitatory amino acids, and catecholamines do not elicit the behavior [1, 2, 6]. Flank marking is also specific to AVP V1 receptors, as the behavior is selectively inhibited by V 1 receptor antagonists and activated by V1 receptor agonists [4, 5]. The behavioral effects of AVP are not limited to flank marking in hamsters. Vasopressin is a neurotransmitter released centrally to affect various behaviors, e.g. arousal , temperature regulation [8, 9], aggression [10, 11], memory  and grooming . However, the ability of centrally acting AVP to induce intense stereotyped behaviors [1, 14] raises the possibility that this neuropeptide may be associated with the induction of compulsive behaviors in humans. Indeed, alterations in AVP regulation and secretion are thought to be one possible biochemical abnormality in patients with Obsessive Compulsive Disorder (OCD) [15–18]. This disorder is characterized by sudden, recurrent thoughts or images that intrude into consciousness (obsessions) driving stereotyped acts that the person feels compelled to perform (compulsions) . Interestingly, patients with OCD show elevated basal levels of AVP in the cerebrospinal fluid and exaggerated plasma levels of AVP in response to hypertonic challenge . Many patients with anorexia nervosa and bulimia nervosa, both compulsive eating disorders, have abnormal levels of AVP in the cerebrospinal fluid and plasma [15, 17]. Pediatric patients with severe OCD have low levels of AVP in cerebrospinal fluid, while a subgroup of pediatric patients with compulsive checking rituals has elevated AVP levels . Hence, there are many clinical examples of compulsive behavior associated with a perturbation in the AVP system. Given the association between AVP and OCD and the stereotyped nature of AVP-induced flank gland grooming and flank marking, the present studies were undertaken to determine whether clomipramine and fluoxetine, two drugs used to treat OCD in humans  might inhibit these AVP-induced behaviors. Clomipramine is a non-selective re-uptake inhibitor of serotonin, and to some extent norepinephrine  and fluoxetine is a selective serotonin re-uptake inhibitor . Both of these drugs have proven to be effective in different animals models of OCD . As an additional control, hamsters were also treated with desipramine, a noradrenergic re-uptake inhibitor  that has been found ineffective in inhibiting OCD in preclinical  and clinical studies [26, 27]. Microinjection of 10 μM AVP caused robust grooming and flank marking. In fact, animals groomed for up to 50% of the duration of the tests. The comparisons between groups showed some effects of treatment on flank marking activity (F(3,25) = 3.6, p < 0.05) (Fig. 1). Animals treated with clomipramine or fluoxetine flank marked significantly less than vehicle-treated animals (p < 0.05). Animals treated with desipramine flank marked as much as vehicle-treated animals (p > 0.1), but flank marked more than animals treated with clomipramine (p < 0.05). However, the comparisons failed to show any effect of treatment on grooming activity (F(3,25) = 0.61, p > 0.1) (Fig. 1). Indeed, regardless of treatment groups, the animals spent a similar amount of time grooming after microinjection of AVP. Flank marking and grooming behavior (Mean ± SEM) following microinjection of arginine vasopressin (10 μM in 100 nl saline) in the anterior hypothalamus of golden hamsters treated with vehicle (Veh), clomipramine (Clom), desipramine (Des), and fluoxetine (Fluox). All animals were treated with 2 mg/day for 2 weeks. Clomipramine treatment results in a dose-dependent inhibition of flank marking behavioral following two weeks of clomipramine treatment. Flank marking was triggered by the microinjection of 1.0 μM AVP in the anterior hypothalamus. In the present experiments, AVP-induced grooming and flank marking behaviors were tested in hamsters exposed to chronic treatment with psychotropic drugs shown in preclinical and clinical studies to be effective in the treatment of OCD [20, 28]. The results show differential responsiveness to these treatments. While grooming remained unaffected, flank marking was inhibited by treatment with fluoxetine and clomipramine but not desipramine. Clomipramine showed a dose-dependent decrease in flank marking. These observations lead to two main conclusions. The first conclusion is related to the neurochemical properties of fluoxetine and clomipramine. As noted earlier, fluoxetine is a selective serotonin re-uptake inhibitor while clomipramine is a non-selective re-uptake inhibitor of serotonin, and to some extent norepinephrine. The effectiveness of these drugs presupposes a serotonin mechanism is involved in the suppression of AVP-induced flank marking. The second conclusion is related to observations on grooming. 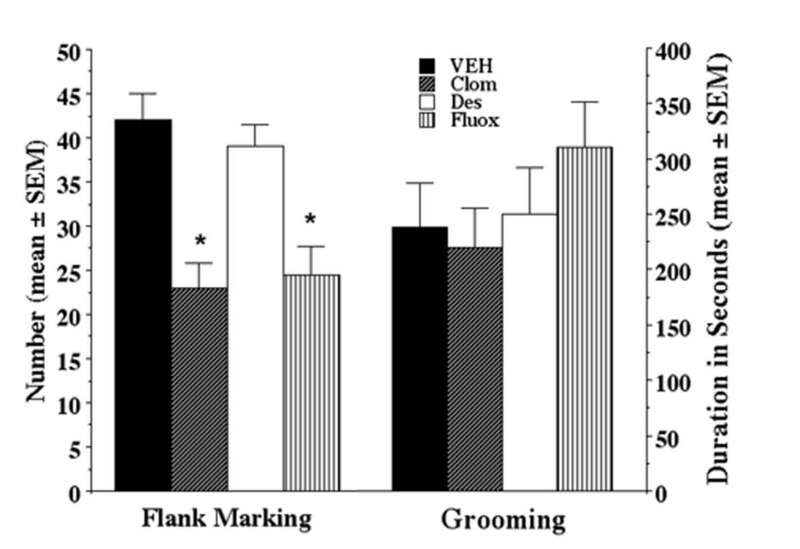 While bouts of grooming are coincident with flank marking, the selective inhibition of flank marking and not grooming by clomipramine and fluoxetine suggest the two behaviors employ different neuronal networks and neurochemical signals for their control. Although earlier studies have implicated grooming behavior as a phenomenological correspondent to OCD [25, 29] inhibited by drugs like clomipramine or fluoxetine, the situation appears different for AVP-induced grooming in hamsters. In canine acral lick dermatitis, the excessive licking of the paws and flanks was significantly reduced by fluoxetine and clomipramine two and three weeks into treatment, respectively . However, the scale of the reduction was more pronounced over a five-week period of treatment . Perhaps flank gland grooming would have been significantly altered in these studies if drug treatment had been extended for several more weeks. The present data show that AVP-induced flank marking is selectively inhibited by chronic treatment with serotonin re-uptake inhibitors such as fluoxetine or clomipramine, instead of noradrenergic re-uptake inhibitors such as desipramine. Similar patterns of results have been observed in animal models of OCD such as canine acral lick . These observations are not limited to animal models. Selective serotonin re-uptake inhibitors are recognized as an effective biological treatment for OCD . In a double blind, placebo control study, treating over 500 patients with OCD, clomipramine was found to be superior to placebo . Differences between clomipramine and placebo were noted as early as one week after the start of treatment, with significant clinical improvement occurring after six weeks of treatment. Fluoxetine also results in a significant reduction in OCD severity that takes several weeks to realize [31, 32]. This therapeutic delay has been related to a down-regulation of serotonin autoreceptors with chronic exposure to elevated serotonin [33, 34]. Together, these data have been used to link OCD with a dysfunction in serotonin neurotransmission . Of course, it is unclear whether prolonged treatment with these re-uptake inhibitors is restricted to serotonin alone or impact on the activity of other neurotransmitter systems. For example, chronic treatment with fluoxetine decreases the release of AVP from rat hypothalamic organ cultures . This finding is particularly noteworthy since alterations in AVP levels in the cerebrospinal fluid have been correlated with occurrences of OCD [15, 16]. The occurrence of OCD has also been correlated with increased levels of oxytocin, a neuropeptide closely related to AVP . In golden hamsters, the elevation of serotonin in the anterior hypothalamus following fluoxetine treatment can inhibit the activity of the AVP system related to aggressive behavior [10, 11]. The ability of microinjected AVP in the anterior hypothalamus to enhance aggressive behavior in golden hamsters is blocked by fluoxetine treatment and serotonin 5HT1A receptor agonists . The present data include AVP-stimulated flank marking in the list of behaviors suppressed by fluoxetine treatment. These results show AVP-induced flank marking is inhibited by chronic treatment with fluoxetine or clomipramine, but not desipramine. This pattern of responsiveness to drug treatment suggests that AVP-induced flank marking may be used as a model for screening psychotropics used in the treatment of OCD. It is a cost-efficient, ethical alternative to existing models, and can be useful in further advancing our understanding of OCD. Future studies could focus on effects of long-term elevation of AVP in hamsters; dose-response manipulations of psychotropics or clinical use of AVP receptor antagonists on humans to further investigate the role of AVP in OCD. Experiments were performed on adult male golden hamsters (Mesocricetus auratus) weighing approximately 160 g. The animals underwent stereotaxic surgery, and were allowed to recover before behavioral testing. The hamsters were kept on a reverse light cycle (14L: 10D, lights on at 19:00) in Plexiglas cages, and received food and water ad libitum. All behavioral tests were performed during the dark phase of the circadian cycle under dim red illumination. All animals were acquired and cared for in accordance with the guidelines published in the NIH Guide for the Care and Use of Laboratory Animals. Animals were divided into four treatment groups: vehicle control (Veh, 75% Tris-buffer saline, pH 7.4, and 25% dimethyl sulfoxide; n=9), clomipramine hydrochloride (Clom, 2 mg/day; n=8), desipramine hydrochloride (Des, 2 mg/day; n=9) or fluoxetine hydrochloride (Fluox, 2 mg/day, n=8). Animals were given subcutaneous injections each morning for two consecutive weeks. The doses and treatment regimen for each drug were comparable to those used in several preclinical studies examining the pharmacological control of OCD [25, 38, 39]. Acute drug trials were not attempted as the experimental design followed that of previously published studies [25, 38, 39]. After 2 weeks of treatment, hamsters were tested for flank marking after a microinjection of AVP (10 μM in 100 nl saline). This dose results in a maximal activation of flank marking . Vasopressin was microinjected into the anterior hypothalamus of the hamsters with a 1 μl Hamilton syringe connected through PE-20 tubing to a 33-ga needle which was inserted in the guide cannula and lowered to the target site. Vasopressin-triggered flank marking occurs with 60 sec of microinjection and lasts for ca. 4–5 min . A trained observer recorded the number of flank marks and the amount of time spent grooming for a 10-minute period. All behaviors were videotaped for further verification. Flank marking tests were run ca. 60–90 min after subcutaneous drug treatments. The results were compared between groups with ANOVAs followed by Fisher PLSD post-hoc tests. Although the effects of fluoxetine and clomipramine on flank marking were statistically significant in the drug comparison studies (Fig 1), the effects were limited to a 30–40% reduction. As noted, the microinjection of 10 μM AVP causes maximal flank marking, hence it is likely the inhibition of behavior with drug treatment might have been more pronounced if the animals were challenged with lower doses of AVP. To this end, dose-response data for clomipramine were generated in animals microinjected with 1.0 μM AVP. Three groups of six animals each were treated with vehicle, 0.001 mg/kg or 0.03 mg/kg of clomipramine each day for two consecutive weeks. Since the initial drug trials were effective with fluoxetine and clomipramine given in a dose of 2 mg/day, this dose-response study worked in a range of 100–10,000 times less clomipramine used in the initial trial. On the day of testing, animals were treated with clomipramine and 60–90 min later microinjected with 1.0 μM AVP in a volume of 100 nl and scored for flank marking and flank gland grooming. Stereotaxic surgery was performed under pentobarbital (Nembutal, 35 mg/kg, Abbott Laboratories, North Chicago, I<) anaesthesia. The Stereotaxic coordinates were: 1.1 mm anterior to the bregma, 1.8 mm lateral to the midsagittal suture at an 8° angle from the vertical line, and 4.5 mm below the dura. A unilateral 26-gauge guide cannula was lowered to the site and secured to the skull with dental cement. The guide cannula was closed with a 33-ga obturator extending 1 mm beyond the guide. The inner-cannula used for microinjections extended 3.0 mm beyond the guide to reach the anterior hypothalamus. At the end of the study, animals were sacrificed by decapitation, and their brains were taken out and fixed in 10% formalin. Later, the brains were sliced on a vibratome and the sections were stained with thionin to confirm the location of the microinjection sites in the anterior hypothalamus. The National Institute of Mental Health (NIMH) Grant MH52280 supported this work. Its contents are solely the responsibility of the authors and do not necessarily represent the official views of the NIMH.